Welcome to our high adventure learning laboratory! 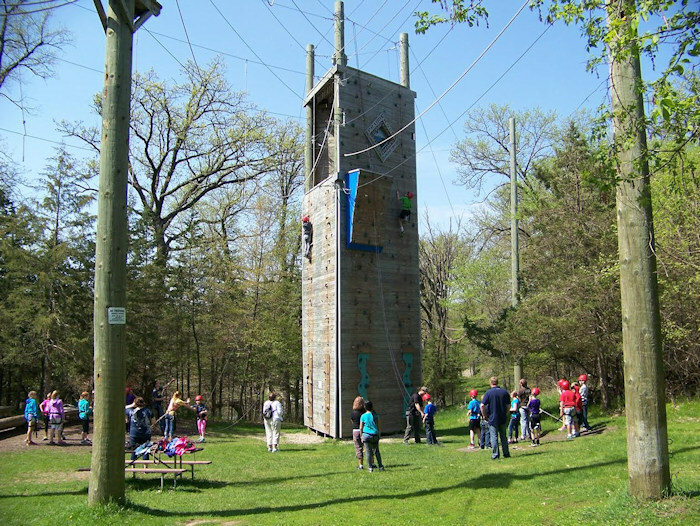 On Prairie Woods' challenge course, high ropes, and climbing walls, your group will learn--and teach each other--about communication, cooperation, creative problem solving, and courage. Since 1996, more than 100,000 people, ages four to 90+, have participated in Challenge Course programs at Prairie Woods. Challenge Course users include school groups, high school and college athletic teams, church youth groups, local camps, YMCAs, alternative schools, students senates and leadership organizations, 4H, FFA, scouts, families, and corporate retreat groups. We welcome groups from across Minnesota and beyond. The Challenge Course at Prairie Woods will accommodate group sizes of up to 200 participants. What is most important for your group? Challenge Course programs are customized for each group. Choose from five areas of emphasis, or let us know specifically what you are looking for. 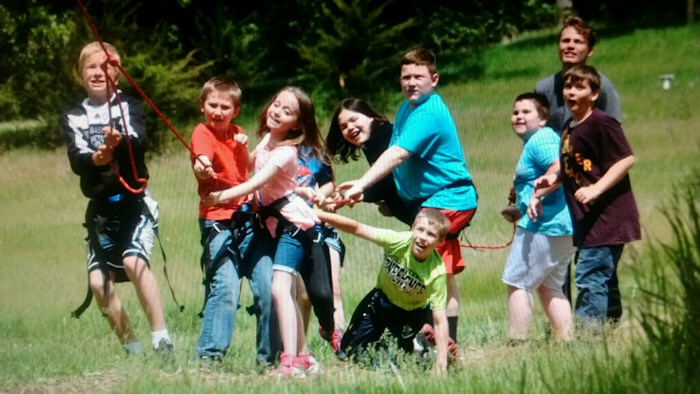 Adventure programming at Prairie Woods has always been a community effort. Membership in the Adventure Co-op is open to schools, camps, human service agencies, and other organizations interested in partnering for high-quality programs and cost-savings. Staff from Co-op member organizations are trained to co-facilitate challenge course experiences. Prairie Woods hosts at least two training events a year, free to Adventure Co-op members. Your staff are already the experts on your students and clients....through Challenge Course facilitator training they become experts on the menu of activities at Prairie Woods. Together, we then customize adventure experiences to target the issues, goals, and objectives important to your group. Significant discounts on Challenge Course programs. On-going program design consultation and supervision. Broad flexibility in scheduling events at Prairie Woods. Enriched skills and diversified work experiences for your staff. Maintain high standards for safety and quality by attending annual trainings. Provide co-facilitator staff for programs scheduled by/for your organization. Explore collaborations with other Adventure Co-op members to create excellent adventure education opportunities for our region. Support the Adventure Co-op by paying a yearly membership dues. Membership costs are quickly recovered by Adventure Co-op discounts.